The culture, architecture and natural wonders of China are reason enough to visit this country hundreds of times, but lets not forget another very important attraction of the place: the cuisine. You may think that Chinese food is available virtually in every part of the world nowadays, and that merely wanting to eat Chinese is not exactly a good pretext to go to China. 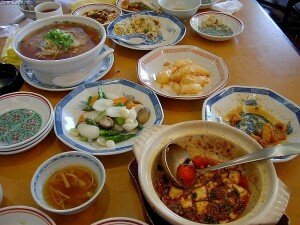 However, authentic Chinese cuisine may prove to be a real surprise to your tame, westernized taste-buds. Chinese cuisine can be very surprising for someone who is not used to unusual ingredients, condiments and methods of preparation. But cuisine is such an important aspect of the Chinese culture that it would be a waste not try some of the more unusual dishes during your stay. According to a Cantonese saying, anything that walks, swims, crawls or flies with its back to heaven is edible. Well, these eggs won’t do any of the above, actually, they look like they haven’t been doing much at all for the past few centuries. 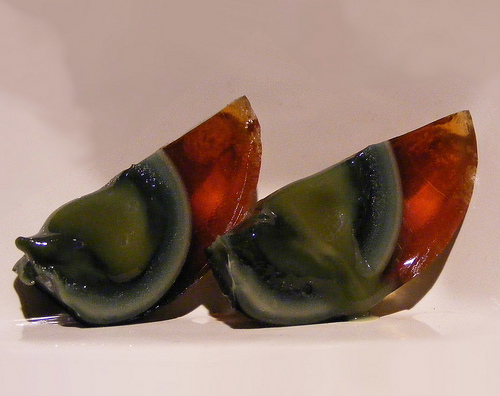 Also called millennium eggs, thousand year old eggs or preserved eggs, this dish is not really from the times of your great-grandparents. These are duck, chicken or quail eggs preserved in a mixture of clay, ash, salt, lime and rice hulls for a few weeks to a few months. Because of this, the eggs have a grayish/brownish/greenish colour and smell of sulphur. Appetizing they are not, but they they are supposedly truly delicious. Street food stalls in Beijing sells a lot of snacks that don’t even resemble food to the untrained eye. Even if you’ve never thought of eating scorpions in your life, if you want to earn the respect of the locals, try one of these crispy scorpions on a stick. The flavour is described as slightly bitter and not especially unusual, but the simple idea of biting into something which still has its stingers attached is a bit revolting for some people. Za Sanpin is a dish made of deep fried honey bees, served as a side-dish to beef. The beefs are dusted with salt, and then deep fried in oil. 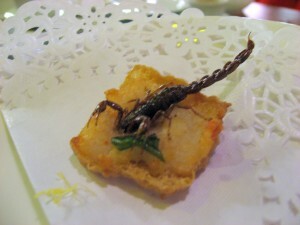 If you can get past the looks of the dish, the taste is nothing shocking, just as with other insect-based Chinese dishes. 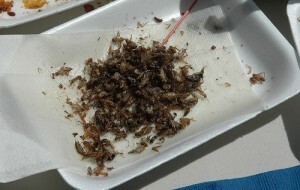 And as with other insect dishes, this one might be eaten more by thrill-seeking tourists than the locals. This is a traditional Sichuan dish, with the typical spicy flavouring of Sichuan dishes, and it doesn’t seem strange at all until you check the ingredients: mustard, preserved tofu, congealed pork’s blood and sliced pork intestines. 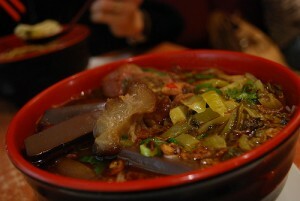 By local standards this is a pretty tame dish, seeing as offal has always been used in traditional Chinese cuisine. Other similar dishes contain stomach, lungs, kidneys or even bronchus. Popular in many Chinese provinces, this dish has no resemblance at all to the cute bunnies you are used to. Rabbit heads are skinned, cleaned and fried. 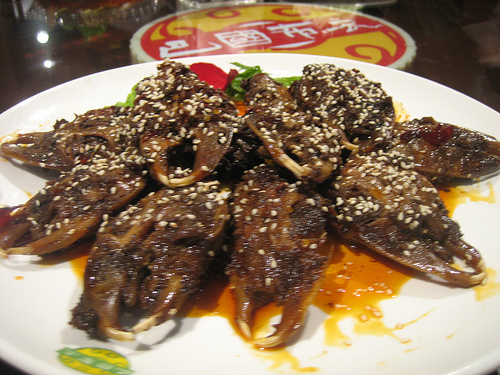 They are very spicy, and supposedly delicious, if you can get over its appearance (they still look like rabbit heads). The best parts of this dish are the rabbits tongue and brains. Sounds disgusting, but if you visit the city of Datong in Shanxi province, you’ll see that they have an entire street lined with rabbit head restaurants, so this dish is indeed enjoyed by people.